The Amur Maple is native to Northeast China and Japan. Amur maple has only started to attain popularity as a bonsai. It can be grown as a multi-stemmed clump or can be trained into a small tree with a single trunk. The tree grows about 20 to 30 feet tall in the wild. The bark is smooth, reddish in color and fairly thin. Acer Ginnala takes well to bonsai techniques. Due to excessive branchiness, some pruning is required early in the life of the tree to create dominant major branches. It tolerates heavy pruning. New shoots should be pruned through the growing season. Acer Ginnala may be wired, but like other maples, may require some protection of the bark. It is the only one of the simple-leaved maples for which the leaves are clearly longer than wide and the terminal lobe is much longer than the lateral lobes, often twice as long or more. Its Summer color is green, but is mixed with bright red samaras or ‘helicopters’ in Midsummer. This hardy tree and its varieties typically produce very colorful yellow to orange Fall foliage. Its leaves will reduce to under one inch if it is defoliated once every two years in mid-Summer. It develops clusters of fragrant, yellowish-white flowers in Spring. It is one of the very few maples that have fragrant flowers. Hardiness zones 3-8, (-10°C/15°F,-37°C/-35°F) in Winter. 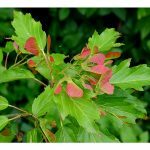 Very weather resistant, in fact, it is more tolerant of adverse conditions than most other maples. May be grown in somewhat hotter areas if care is taken to prevent leaf-burn or dehydration. These deciduous trees are best grown in normal garden soil. Best in moist, well drained soils, but also tolerates dryness; tolerates neutral soil pH; salt tolerant. It is a vigorous grower that is very tolerant of temperature extremes. Full sun or partial shade; but part shade in Midsummer and in very hot climates to prevent leaf burn. Amur Maple likes moderate watering. Increase watering during the Summer heat, and keep fairly dry in Winter. It is drought resistant once established.